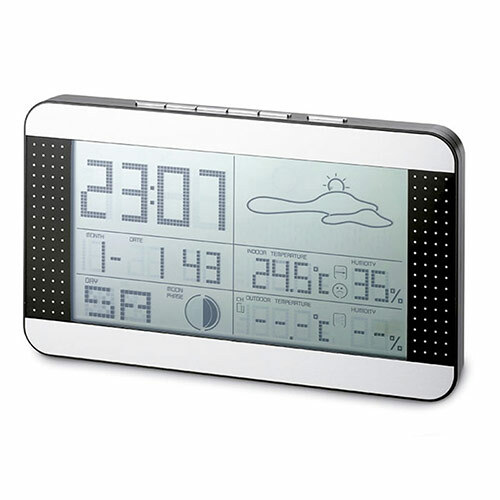 A modern multi-function weather station with flat LCD screen display to show time, calendar, indoor/outdoor thermometer and a hygrometer. These versatile devices can sit on a desk or shelf or can be wall mounted. They can be branded on the silver coloured plastic front panels by laser engraving with ink infill, a technique that leaves a clean, smooth and durable inscription. Create branded merchandise or corporate gifts with these quality multifunction weather stations and have your name displayed in front of key customers, clients, prospects or team members as they use these highly practical clocks.